As incredible as our first tour with Phuket Sail Tours was, I think the next day was even better. This is probably because it involved two of my new favorite things, 1) animal experiences, and 2) doing things I didn't think I could do. 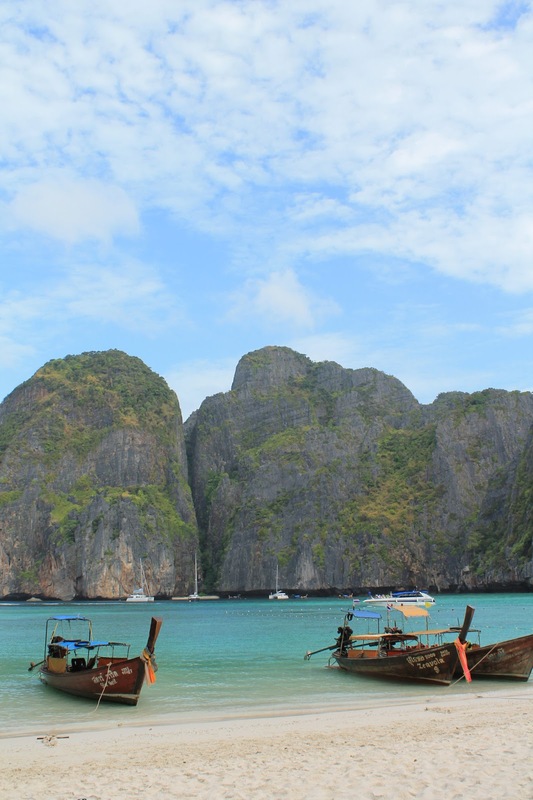 The first stop was Maya Bay, the setting for the Leo DiCaprio movie "The Beach." This gorgeous beach becomes very crowded throughout the day and we got there just in time to enjoy it before the masses came. We jumped on the white sandy beaches, explored, and found the spirit houses. Spirit houses were all over Thailand. They believe that when you build something, you disrupt the spirits and need to make sure they have a place to live. So you will see little doll-house sized homes for spirits in front of every dwelling, temple, and most businesses. The most embarrassing moment of the day was when we had a photo opp to jump off the boat into a beautiful lagoon in front of the gorgeous scenery. I'm not a great swimmer despite growing up at the beach and spending three summers in the beginning swim class before begging my mom to let me stop. I also apparently don't like heights that much (as learned on my elephant ride) and have to hold my nose when I get to the water or I freak out and can't breathe, so jumping in a non-awkward way for the photo was going to be difficult. When it was my turn, my body just froze completely. It would not move along with my thoughts and I panicked. I let others go in front of me. I didn't think I'd be able to do this and I didn't really understand why. I tried again a few minutes later and froze just a little this time and jumped off in probably the least graceful way possible. It wasn't great, but I was in the water and I was okay. So I got up and tried again, and this time, I froze so much that the tour guide got up and threw me into the water. I forced myself to try two more times without being scared because I couldn't understand what I was so nervous for and I felt absolutely ridiculous. If I had been able to jump one more time I think I would have gotten it but the boat had places to go and monkeys to feed. We got to Monkey Beach before any other tour boats got there and fed the monkeys lychee fruit (which prior to Asia I had only had in martinis). This was another occasion in which volunteering to go first was a good decision. Once all the other tourists got the island, they were all competing for the monkeys' affection, but Katie and I were able to bond with our new friends without much distraction as two of the first in our group to volunteer. The other thing I wasn't sure I'd be able to do was snorkeling. I had done it ten or so years before while in Puerto Rico, but had quit after just a few minutes the day before. This tour had a bunch of different snorkeling opportunities and I didn't want to miss out again. I learned that you have to spit in the goggles to make them not fog up which made me feel a little better while underwater that I wasn't going to swim into a family of sharks. I also got the breathing down after thirty seconds of panicking. 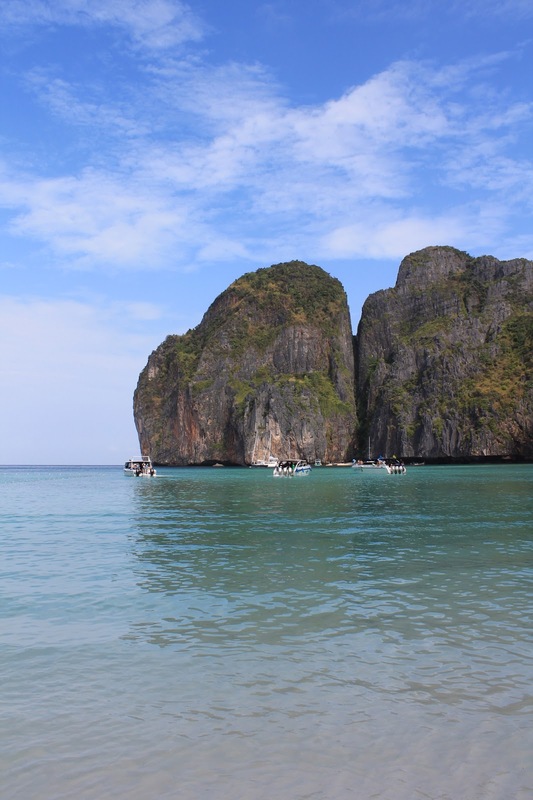 I was able to enjoy it and swim right up to the fishies and through caves and around the coral. We brought bananas with us in the water and people were breaking pieces off to give to their fishies but I realized if I just held the banana in front of me that swarms would come and hang out. That was pretty cool. And now I won't be panicked to snorkel in the Great Barrier Reef whenever I end up there (hopefully within the next two years). One of the upcoming items on my 28 Things is going to test this fear of heights/falling thing again. Kat and I are signing up tomorrow and I hope I don't freeze again like I did on the boat. Don't worry, it's not as crazy as bungee jumping or skydiving, but it does involve flying through the air with the greatest of ease. I've said too much.